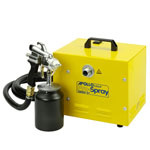 We stock a comprehensive range of HVLP spray systems from key manufacturers Graco, Bambi (Apollo UK) and Apollo Sprayers Int'l. 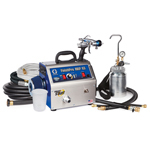 There are models ideal for DIY spray painting right through to higher performance professional systems for increased productivity and durability. Unlike conventional airspray, a HVLP Spray system utilises a lightweight air turbine rather than a large air compressor to supply the air to atomise the paint. Being lightweight they are highly portable and won't break your back carrying them around site! 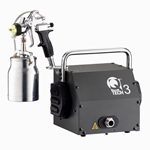 With HVLP Spray Guns the air is supplied at a much lower pressure which means that the amount of overspray is substantially reduced as it is propelled toward the object you are painting an a much lower speed than with conventional airspray. 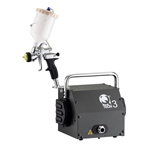 To compensate for the lower pressure (LP) these systems supply a higher volume (HV) of air to atomise the paint. HVLP turbine systems can be used with a wide range of decorative and industrial coatings including woodstains, lacquers and gloss - perfect for an automotive spray gun. The smaller models are also very popular as spray tan applicators bought by end users and professional tanning salons. Do you need a 2,3, 4 or 5 stage HVLP turbine? 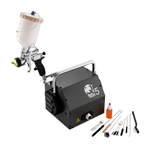 There is a wealth of HVLP spray guns on the market, but which should you choose? In essence the greater the number of stages the more powerful the turbine, so a higher pressure & volume can delivered. For occasional or DIY use consider a 2 stage HVLP paint spray system such as the Spraymate Easy Sprayer or the more robust Spraymaster 1200-2S. 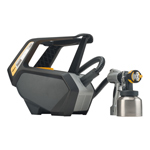 For more regular, faster application a 3 stage HVLP paint sprayer will suffice, consider the Pro-Spray 1500-3s, Apollo Sprayers 835 and Turboforce 7. 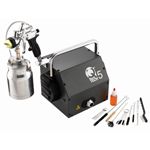 But if your looking for a regular on site workhorse, capable of atomising higher viscosity materials or you want the fastest possible application then choose a 4 or 5 stage HVLP system that develops higher output pressure and volume - for uses such as an auto spray gun. 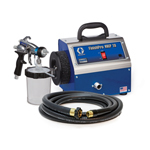 We've selected the Graco HVLP Turboforce 9.0 & 9.5 as the systems we feel best match performance against price in this higher end of the HVLP paint sprayers spectrum. 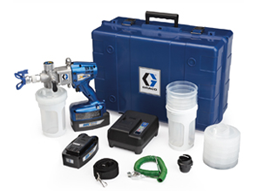 Whether its for Bambi Sprayers or Graco Sprayers, whether it's a gravity over cup kits, radiator extension kit, ProComp pack or artisan air control valve, we have a range of HVLP accessories for all your HVLP paint spray needs. 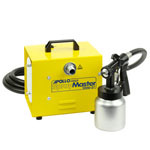 Lightweight, compact and portable, this Bambi Spraymaster HVLP system utilises a high efficiency turbine requiring no compressor and is capable of spraying most types of coating cleanly, easily and without wastage. 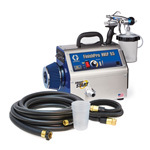 Designed for the serious sprayer, this Bambi Pro-Spray High Volume Low Pressure model has a powerful 1500 watt 3 stage turbine and the ability to handle all types of coatings. 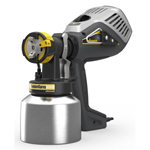 The Wagner XVLP FC3500 is the ultimate tool for the painting professional. Perfect for the smaller projects, repairs and touch ups where a controlled finish is required.